The cat is out of the bag. Coalesce to tour East Coast, and couple Regional shows. UPDATE 6/24/07: LINKS ADDED FOR TICKETS AND FOR VENUES FOR DIRECTIONS. UPDATE 6/29/07: ALL SHOWS HAVE PRESALES ON TICKETS. LINKS ARE FOR YOUR CONVENIENCE IF YOU ARE AFRAID IT WILL SELL OUT DAY OF. 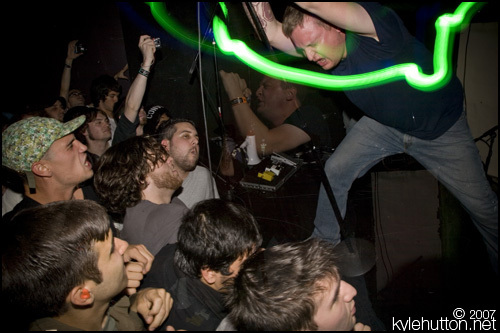 In 2005, coalesce attempted to play the ill-fated Hellfest as a way to bury personal hatchets, and put some closure to something that held so much history and memories for them. A problem arose once rehearsals began since, unexpectedly but perhaps inevitably, new music emerged. Since this occurred after the Hellfest show was booked, the market had already dictated this as a restrospective stint with closure culminating in a final show. After the skeletons of a couple new songs were built, the band flirted with different ideas as to how to preserve the “conclusion” of coalesce, while yet pursuing wherever the new tunes might lead. This ultimately proved silly. It was clear that the new songs were coalesce, despite a new member and some tinkering with the sound. Despite the potential backlash for perpetuating their reputation of dis- and re- banding, coalesce decided to stay coalesce, an open-ended project intent on moving forward without looking back. Instead of looking at coalesce as a second career or some ego-stroking project to prove something within modern music, it is being held closely and personally by the members as their time to put aside familial duties, work, school, or whatnot, and simply “do it.” In short, we just want to hang out together again and play our shows out of a peculiar love for doing so (in all it’s ugly purity). The new 7″, Salt and Passage, is the first release since the Relapse record 012: Revolution… Salt and Passage is finished and ready for absorption in the market. This will coincide with an East Coast/Midwest stint in August. Coalesce will be touring with The Daughters (Hydra Head), and See You Next Tuesday (Ferret) on the East Coast dates (including Chicago) and This is My Condition in the Midwest. Full dates and details are listed below. Please let us make it very clear that this is not a “reunion” tour in any way shape or form. Since it’s simply the nature of coalesce to come and go as it pleases, terms like “reunion” make no sense when applied to it. The Line up will be Jes Steineger, Nathan Richardson, Nathan Ellis and Sean Ingram. The same as 2005, the same as recorded. The current line up. Coalesce will have Salt and Passage available exclusively on tour before its official release date on September 11. Also available on the tour prior to their respective street dates will be the new dvd box set No Business in this Business and the re-press of the Hydra Head release There is Nothig New Under the Sun.